In the "ccleaner" list of installed programs I find NVidia GEforce. When I click on it, on the right, in the list of options, "Uninstall" appears in blue as do rename and delete (repair remains grey). How do I go about uninstalling this? have you tried doing it the ol' fashioned way, via Control Panel, Programs and Features. CC should initiate the same uninstall process as the Control Panel approach. if that also fails to uninstall NVidia, there should also be an Uninstall entry in the NVidia folder in Start, All Programs that you can try. and as a last resort, I'm pretty sure I've used in the past a 'removal tool' you can get off the NVidia website. 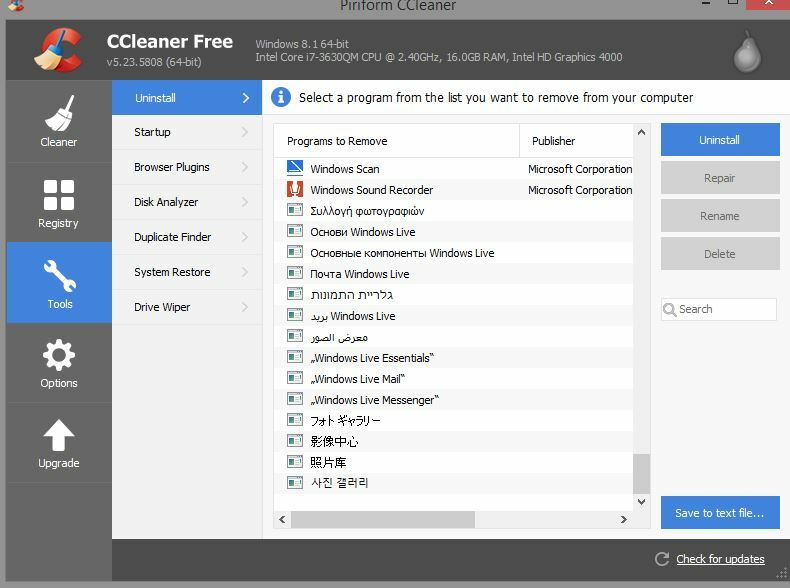 I have noticed sometimes in the CCleaner uninstall list that the first item I highlight and click uninstall for seems dead. I play about about with the clicking and then it works. Are you sure about uninstalling Nvidea GeForce? They belong to Windows Live (language files) and can be uninstalled. If you go into Control Panel you will see the info a bit more about it.